From 2007-2010, Kellogg's issued small sets featuring MLB stars. These were included with the company's food products, which as far as I've seen here would mean mostly cereal. Of course, the checklists focused heavily on Japanese stars in the MLB, but it's not exclusively for former NPB players. The sets all feature the Kellogg's logo on front and back as well as the manufacturer's logo. Upper Deck issued the 2007-2009 sets, with Topps taking over in 2010 after Upper Deck lost their license. With very small checklists, collecting full sets shouldn't be too hard, and is a project I am considering. On the other hand, singles usually aren't cheap. I should note that my checklists (including spelling) are based mostly on the SCF database. 2008 again has 10 cards, and three Japanese players. Note that the SCF database is incorrect; based on a bit of research the below list should be accurate. The last year of issue was 2010, with Topps taking over due to Upper Deck's loss of licensing with MLB Properties. All in all, a total of 32 cards seem to have been issued. The key cards will definitely be the Matsuis for a set builder. 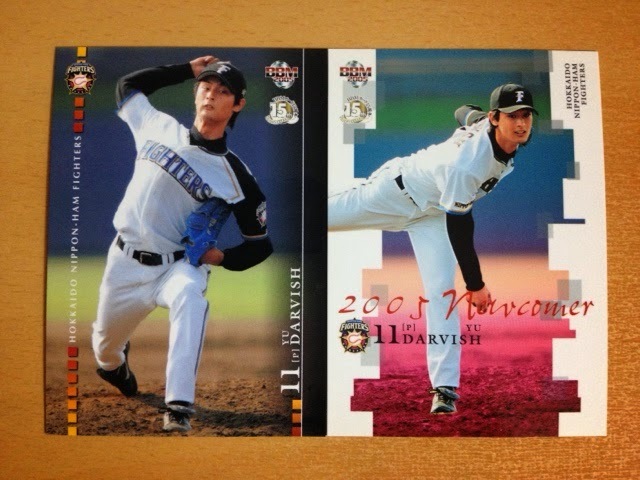 Darvish may have MLB rookie cards in 2012, but you can't ignore his start in Japan. He was drafted in 2004, and as such started appearing in card sets in early 2005. 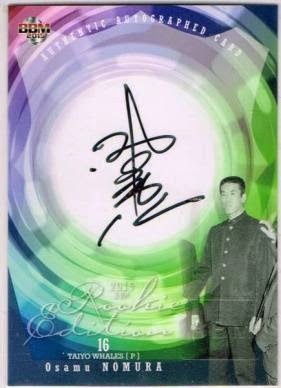 His first card, chronologically, is in the 2005 BBM Rookie Edition set (#12). I think it's safe to say that 99.99% of current rookies get their first card in this annual issue. After that, he appeared as part of a multi-player card featuring the team's draft picks in the "Challengers" box set (#30). And he was included in BBM's 1st and 2nd Version sets (their flagship release) on card #116, with silver and gold signature parallels, and #760. Other rookie-year sets include two cards in the premium Touch The Game set (#25 and #147), with his first relic card - a game-used ball card with a logo parallel, and a photo card. He also has three Konami game cards. There's one more rookie-year set that Darvish appears in; he has two cards in the annual Fighters team set. Card #F03 is on the left, below, and subset card #F72 is on the right. The team set, issued in packs, also includes Darvish's first autographed card, a parallel of the base set limited to only 10 copies. His rookie cards are definitely the key cards in every set above, and while they aren't as expensive as one might pay for Pujols or Ichiro RCs in the US, they usually don't come cheap. But thanks to a poorly-listed auction on Yahoo Japan Auctions, I got both of the above cards and many more singles from Japanese players in the MLB for under $2 shipped. In fact, I didn't realize I was getting Darvish's rookie card until tonight, when I went through and pulled out the singles I needed from the lot. Even without the RC, I certainly got my money's worth, as several cards went to a small collection I'm working on, and a few others went to my type collection - including that Newcomer parallel above. I recently found a new-in-package sticker album from Epoch's attempt to release an active-player baseball set in 2000. As far as I know, this is the only modern attempt at a sticker album set in Japan similar to Panini's baseball stickers in the past and modern-day Topps stickers. The album came in a plastic poly bag for hanging on pegs in stores. A couple stickers are tucked inside the album. PR stickers at the beginning are found in the album beneath the table of contents. Each team has four pages. Due to the way the album is arranged, only two of those pages face each other, with the other two being split. For each team, the first page is for four player stickers plus one of the insert set stickers. The center two pages hold an additional 13 player stickers. The last page for each team is designed to display the nine-card puzzle set for that team. You can see one of my PR stickers in the image above. After the 12 sets of team pages, there are a series of "subset" pages. "The Leading Players" is actually an additional limited insert set, with two stickers per team. Each team, therefore, has an additional page toward the back of the book. There are two pages with lots of text toward the back; these focus on each of the two leagues and there's a "dream team" pair of pages sandwiched between them. I forgot to take a picture of the Dream Team pages. The inside back cover has a complete checklist for the release, including all the inserts. I'd love to have a full set of these stickers, but they seem to be pretty tough to come by. Busting a box or two would be fun and certainly get me close to a set if not giving me a complete set (that might happen soon). There are 204 player stickers, 108 puzzle stickers, 24 Leading Players stickers, and 12 Star Players stickers. BBM has been issuing team sets under the "Legends" name since 2013. Hiroshima is the most recent team to receive the treatment. The base set has 81 cards; #1-72 are "Legends" with a red background. These players were members of championship teams. The design itself is the same as the other Legends series sets, with a cloudy background. Career stats and the usual details are on the back. Photography is generally pretty good. All-Time Legends rounds out the set (#73-81). Players in this subset were not a part of championship teams, but still stand out as great players on the team. Current ace pitcher Kenta Maeda is a part of this subset. There's a gold signature partial parallel numbered to 60 copies. The lone insert is a nine card set titled "80's Best Nine" featuring nine of the best players on the Carp in the 1980s. I guess that goes without saying. There is a parallel of this insert with red foil over the "80's Best Nine" text serial-numbered to 60 copies. There are 49 subjects in the autograph set, most of whom have 100 (or nearly that many) cards in the set. A few players have less. Additionally there are three dual-autograph cards, each with 10 copies. The Legends series is nice in its simplicity, and the player selection focuses on certain eras usually during dynasties. This has the opportunity to provide a bit of a different player selection from the usual anniversary sets. There are still plenty of retired players which have no modern cardboard and are in the record books for winning awards or other accomplishments. But like most of BBM's team sets, there isn't really anything special here for collectors who aren't fans of the respective teams. I like the red and green colors used in the base set; other sets have used more muted tones in blues or grays. I've missed posting about at least one set - the Giants - from this series. 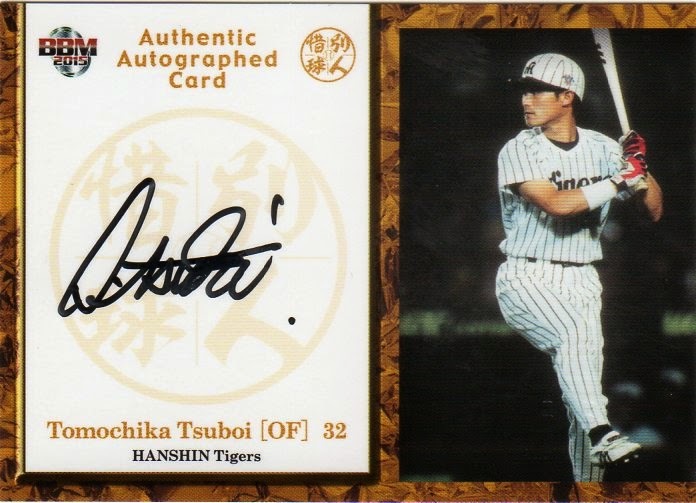 You can see more scans and read a bit more about the set at Japanese Baseball Cards, which NPB Card Guy wrote about a couple months ago... somehow this set slipped through the cracks. Frontier's first offering of 2015 is another super-limited box set that focuses on the hits. This time, it's bats. The base set has only 14 cards, with two different designs. The first half of the set uses an orange running track-shaped border around the photo with all the text at the bottom. The shape is carried over to the back; note that all 14 cards have the same back design. The second half of the set uses a white, black and orange abstract background, and Frontier calls this a subset. 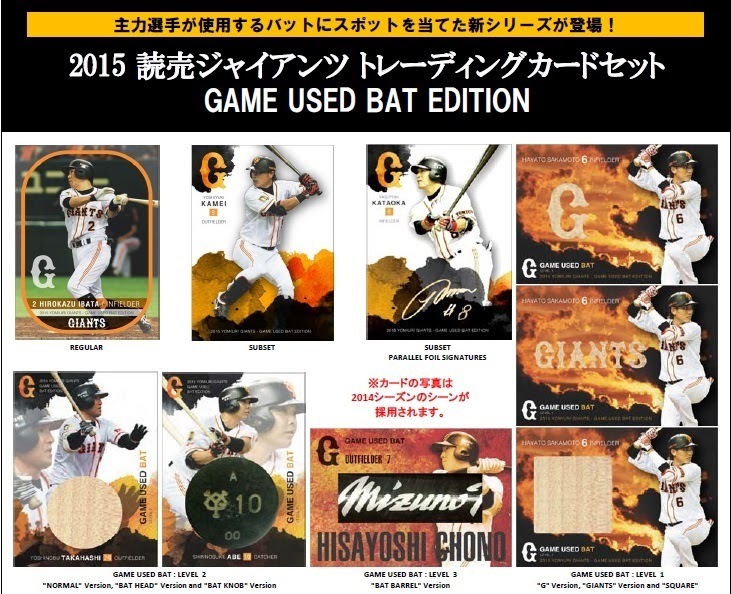 Also of note on the card backs is a picture of the player's bat that was used for the relic cards. Based on the print runs, I come up with a total of 1339 sets, which is pretty low. Full sets with two "hits" had an original retail price of 10,800 yen. Spend enough time in Japan (a day, if you're observant enough) and you'll random Xs. What does that mean? It's a cross-promotion. So at the gift shop, you might find Hello Kitty dressed up as One Piece characters. Check the package, and you should see "Hello Kitty x One Piece" somewhere. Frontier issued two team box sets late last year showing collaborations between Mizuno and the Hiroshima Carp and the Chiba Lotte Marines. Like the Carp set, a fancy black crown design at the bottom of the front has the player's jersey number, position, and name. The team and Mizuno logos appear on the photo on both the front and back. The back photo has a small box around a particular piece of Mizuno sporting goods the player is wearing or using. There are 15 cards in the base set, and some players can have multiple cards if they provided multiple pieces of equipment. Each box came with two special cards, which could be from any of the options below. Boxes included either one relic and one autograph, or two relics. I bought a full Carp base set because I like the concept of highlighting something different (the equipment in this case). Also, the design of the regular cards isn't ugly. I have not yet picked up a Marines set, though I might eventually. Unfortunately, this is one in a long line of "high end" products which is flooding the market with hits. Hopefully things don't get too out of hand like has happened in the US. I've never been really happy with the English title we've given this set. Almost literally, 惜別球人 (Sekibetsu Kyuuhito) translates as "Regret of Departing Ball People" but that certainly makes no sense. Last year, I called the set the Farewell set. I've settled on "Commemorative Retirement Set" for this year's title, and am open to discussion on this. Anyway, this is an annual tradition that BBM has issued including pretty much everyone who retired from professional baseball in the prior year. Issued as a box set, there are 36 base cards in the regular set, plus one additional card included in each box set. The base cards are nothing special, though the design is pleasant. Actually, the top of the photo is full bleed, a design characteristic which carries over the back side. There are 36 cards in the base set, but that doesn't mean there are 36 players - several have multiple cards. About half of the cards feature retirement ceremony images and the other half have action shots. Again, some players have both types, while others have only one. The design remains the same. Ramirez, above, has two cards in the set: an action card which pictures him with the Giants, and a ceremony card with the Swallows. 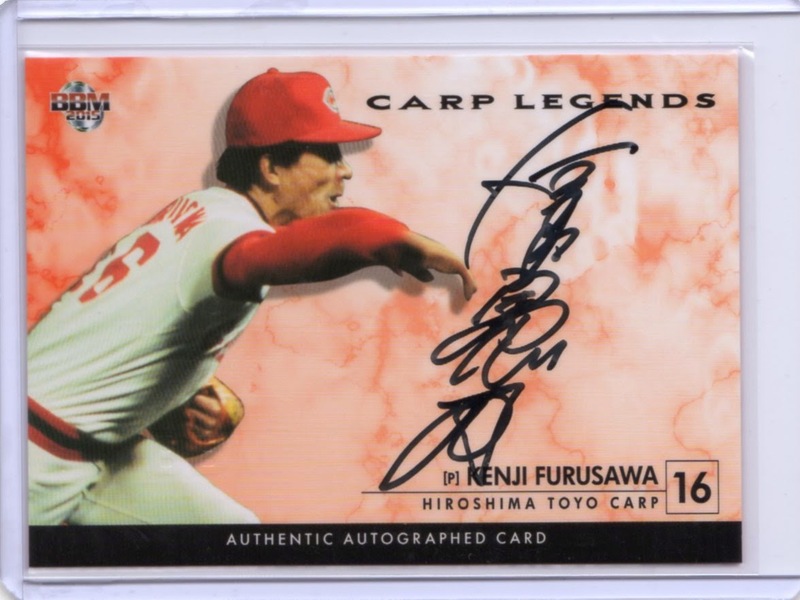 Backs of cards include a list of honors, career statistics (with NPB), and a short write-up. There are two types of premium cards, inserted one per box. The less desirable are the Printed Autograph cards. The more common gold version has a print run of 82 copies, while the rarer blue foil is serial numbered to 30 copies each. 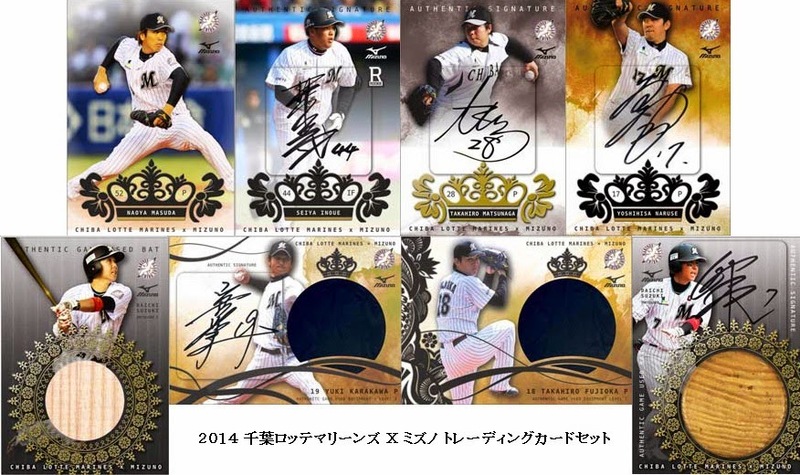 There are 9 cards in the set, so a total of 1008 printed autograph cards were inserted into boxes. More common yet more desirable are the authentic autographs. Most players signed on-card, though three have sticker autographs. Print runs vary but are around 100 copies each. Twenty players are in the set, with a total of 1992 autographs. I'm not sure why, but I haven't seen much opened product from this set available for sale. I was able to get my base card single from my usual card shop. The first of this year's team anniversary sets features the Hawks, which have been owned by Softbank for 10 years now. The base cards have a fairly standard design with the player's name, jersey number, and position at the bottom. Team colors are very visible, and the Hawks' colors go well on cardboard. The base set has 72 player cards with no checklists or subsets. 63 cards have retired players with black bottom borders on the front, while the remaining 9 cards are of active players with yellow bottom borders. There are two inserts. One is a non-premium subset-style insert titled Memories of the Decade. The nine cards in the set feature team highlights. Four cards feature on-field events (winning games, essentially) with the other five cards mentioning managers being appointed or retiring, and the creation of the team. This set is separately numbered (with an M prefix) but appears in packs at the same rate as regular cards. The second nine-card insert is Best 9 of the Decade. This is a premium insert with a foil background; two photos (full body and close-up) are on the front, with the full body shot cropped and put on a yellow-tinted background on the reverse side. As usual, the cards don't have any stats or text to explain why the players were chosen as one of the Best 9. There are 28 autographed cards randomly inserted into boxes, with print runs usually around 120 cards each. Some have about 30 copies each. Of the 28 autograph subjects, eight are mascots like Helen Hawk above (print runs of 105 copies each). It appears that BBM chose not to make any form of parallels for this set. For Hawks fans this will be a nice set, but there isn't much to the set to pique the average collector's interest. The annual Rookie Edition set from BBM came out last month, one of just a tiny handful to be released since the new year. Rookie Edition is by far the biggest release of the pre-season. The Rookie Edition set has, well, rookies. All the players are basically from the prior year's draft, and have nearly identical upper-body shots of the players tossed into their team's uniform. I like the background design, though, with a lot of curves and angles but not overly busy. The backs copy design elements from the front, with a nice group photo taking up some of the space. The text gives a bit of history on the player. Card numbers are in the upper-right corner, and [RE] appears on the copyright line at the bottom. Regular cards are numbered 1-103. There are a couple subsets. Then & Now appears annually and pairs one of the draftees with a historical player. The pairing can be for pretty much any reason. There are 12 cards in this subset, numbered 106-117. The two cards in the middle (#104 and 105) are checklists. These picture each player in the set, which is organized by team. Tiny square headshots are used here. There are two inserts in the set. The larger one is "Next Generation" and has 12 cards (one per team). The foiled fronts have a fire design at the bottom and the set's name in foil stamping intruding right over the top of the photo. The backs use several design elements from the front; cards are numbered in the lower-right. The other insert has two cards, one for each of the Rookie of the Year award winners. The design uses the now-standard gold background with gold foil printing for the set name. Backs have 2014 statistics. 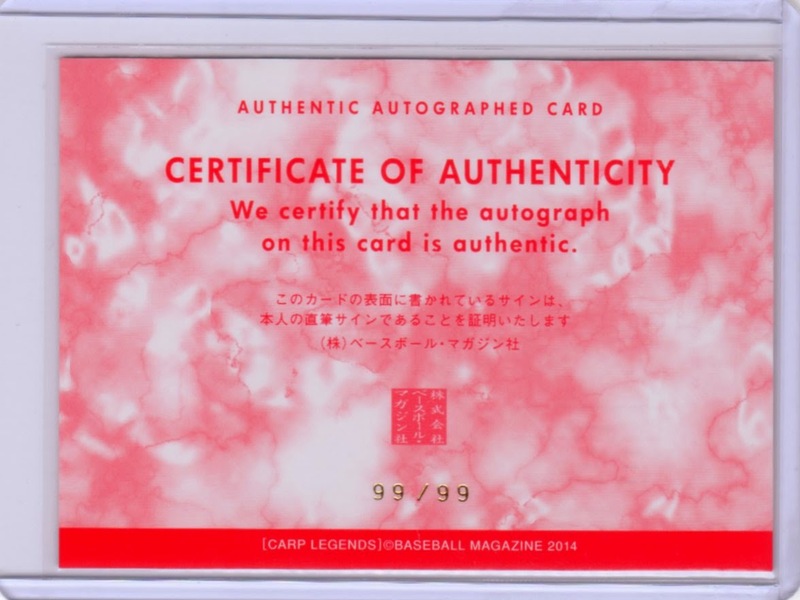 There are two parallels of the base set, a gold-foil signature version numbered to 75 and a red-foil signature version numbered to 30. BBM announced 80 or 81 of the players appear in the parallel sets. BBM doesn't mention it on their site but it appears there is also a blue foil signature version numbered to the player's assigned jersey number. BBM's checklist lists only six autograph subjects featuring retired (OB) players, each with a horizontal and vertical autograph version. Vertical cards have print runs around 75 cards, while horizontal autograph cards have about 25 copies each. 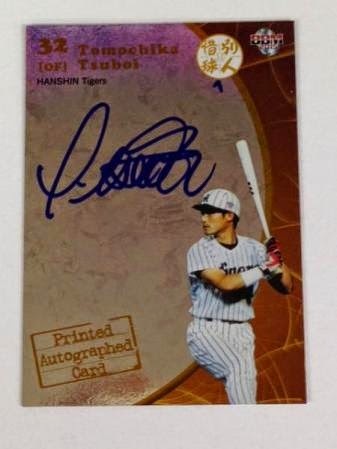 NPB Card Guy has a post on this set too.